“In short, paleontology is the study of what fossils tell us about the ecologies of the past, about evolution, and about our place, as humans, in the world.”[ref]University of California Museum of Paleontology, http://www.ucmp.berkeley.edu/paleo/paleowhat.html. [/ref] Paleontology, the study of the evolution of ancient life, draws information not only from the discovery and study of old bones, but also from archeology, genetics, linguistics, climatology and other fields. Interpretations of existing data differ and can change with each new discover of fossils. Since new bones are discovered quite often, paleontology is constantly a Work in Progress. Before going further, some vocabulary is necessary. A primate is a mammal of the order Primates (logically enough), mostly arboreal, ranging in size from lemurs to gorillas, and including, among others, monkeys, chimpanzees, gibbons and man. 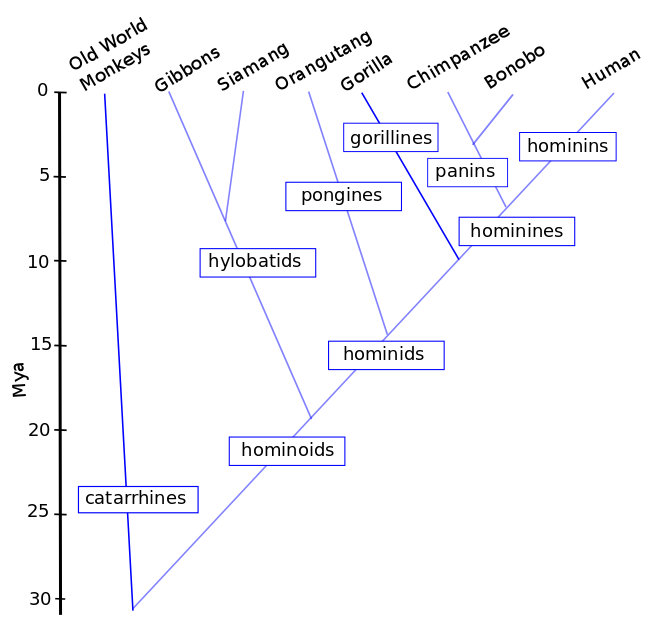 Hominins are species on the main human twig of the bush of evolution, members of the family Hominidae. 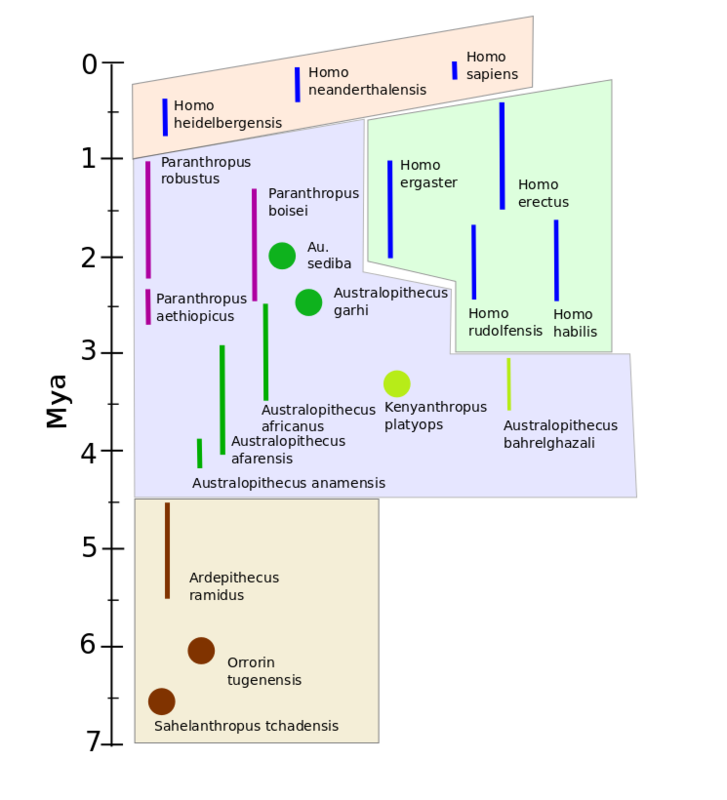 [ref]Wikipedia lists six classifications for humans beneath the family Hominidae: subfamily Homininae, tribe Homini, subtribe Hominina, genus Homo, species, H. Sapiens, subspecies H. s. sapiens. Who can possibly remember and distinguish those three different endings for homini – ai,i and a? [/ref] Members of the chimpanzee twig are called panins. Either such taxonomic[ref]Taxonomy is the practice and science of classification. [/ref] characteristics or genetic analysis may be used to classify different families and species of primates as shown in the figure. Results from the two methods are not necessarily the same. Another way to see this is in the following table. 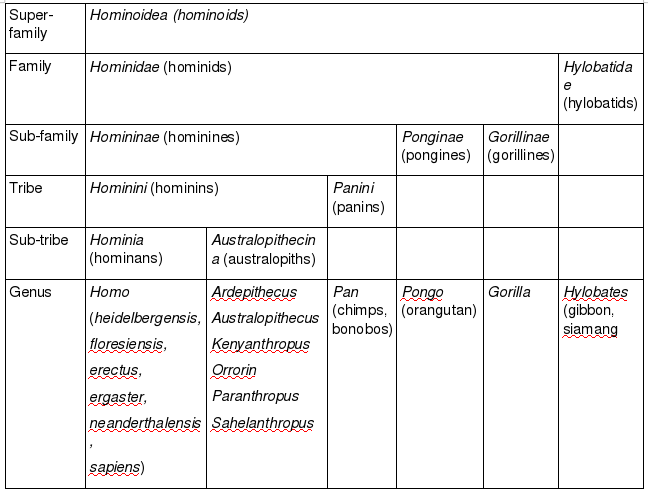 The difference between the table and the diagram in the placement of the Gorillini may indicate the method of analysis used (taxonomic or genetic)[ref]There is disagreement about placing gorillas under hominoids or hominids. See www.hominides.com/html/dossiers/hominoide.php (in French)[/ref]. The energy falling onto the Earth’s surface depends on its orbit – the angle of its rotational axis relative to the plane of the orbit, the precession of the orbit[ref]The elliptic orbit depends on two foci, one of which is at the sun. The other rotates slowly around the sun[/ref] and the changing shape of the orbit, which modifies the distance of the Earth from the Sun. 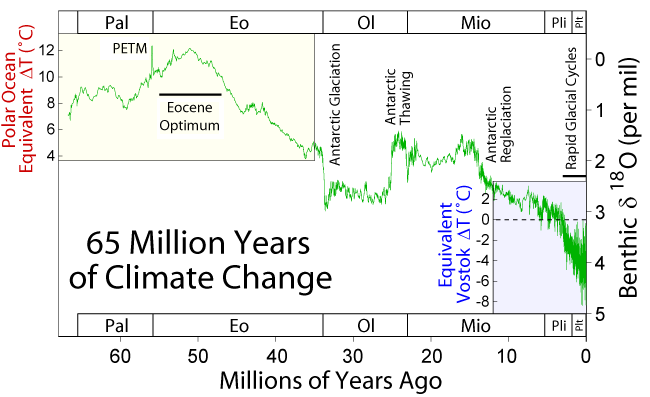 Taking all these into account leads to the calculation of so-called Milankovitch climate cycles. These agree largely with temperature-variation results from geology. As we have seen, these changes in temperature are to a great extent due to geology – the movement of tectonic plates. As plates have moved, oceans have opened (such as the separation between Antarctica and Australia or South America) or closed (Tethys Sea, Isthmus of Panama). This opening and closing of channels changed sea currents (e.g., the Gulf Stream) and led to formation of the antarctic and arctic ice caps[ref]This paragraph is only a summary, ignoring chronology. Formation of the antarctic ice cap coincided with the drop in temperatures at the beginning of the Oligocene, c. 35 Mya, whereas the Isthmus of Panama was closed c. 4-3 Mya and the arctic ice cap formed around 2.5 Mya. [/ref], which in turn brought about lowering of global sea levels. The ice caps themselves reflect solar energy back into space, causing further cooling. Coming together of continents has created mountain chains (Africa pushed up the Alps; India, the Himalayas) which have altered meteorological conditions, especially rain patterns (such as the Asian monsoon). During the latter part of the ice age, melting continental ice sheets have caused sea levels to rise. Geology and climate and, hence, evolution all go together.